Once upon a time, when I was young, carefree, and fun.... (HAHA) I worked for Dana, my dear friend who owned a coffee house in my small town. After mastering the art of coffee, I mastered the goodness of pineapple cream cheese on blueberry bagels. If you have never tried it, please do. This recipe is supper easy, and with the little bite and texture of pineapple I think it is absolutely amazing. It is one of my favorite treats, on its best day ever! Make sure to save your drained pineapple juice, mix it with orange juice or drink it alone or use it in something! In the video, I used 2 TBSP of powdered sugar but you can use up to 4. I tend to go with 4, but I used 2, and it was really plenty to be honest. I have been making this for a little while, but had to nail it down to a recipe of proper measurements. That completely stresses me out! I do it because I LOVE YA! 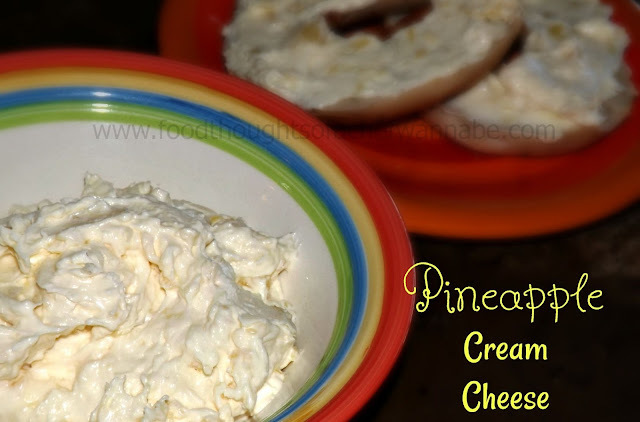 I think this would be a perfect make ahead spread for bagels for a brunch or breakfast, or anytime really. I imagine some graham cracker sticks or Vanilla Wafers might like to jump into this bowl of goodness and then into your mouth too! Throw it all in a bowl and using a hand mixer, let her rip. I like to whip this on high for at least 1 minutes to incorporate some air to keep it spreadable for a long time! Refrigerate whatever you don't use....as if.....and finish it at night when everyone else is sleeping.